DUCC is a member organization of DIAKONIA World Federation and its regional body DIAKONIA of the Americas and the Caribbean (DOTAC). Membership dues in these organizations are paid by the General Council for all Diaconal Ministers in the United Church of Canada (not all United Church Diaconal Ministers are members of DUCC). organise a world assembly every four years. Member organizations are represented on the World Executive through the three regions, DIAKONIA Region Europe and Africa, DIAKONIA Asia Pacific, and DIAKONIA of the Americas and the Caribbean. Linda Ervin, a diaconal minister in the United Church, served as the Vice-President of DIAKONIA World Federation from 2001-2009. (See International: DOTAC for Linda’s reflections.) Many other United Church folks have taken leadership in international diakonia since its beginning, including Ginny Coleman (who was secretary for the World Federation); and, Lydia McCullough (who served as President of DOTA, now DOTAC), Margaret Fulton and Helen Mack, now all deceased. This 2001 Booklet produced by DIAKONIA World describes the organization in more detail. See also the most recent issue of the DIAKONIA NEWS. The next DIAKONIA World Assembly will take place in Darwin, Australia in 2021. DUCC is eligible to send two voting delegates to each Assembly. One position is automatically given to our DOTAC representative (Currently Ted Dodd, All United Church Diaconal Ministers, as well as all members of DUCC are eligible to apply to fill the other voting position. Some financial assistance is given to the official representatives directly from the DUCC budget and through application to the Kaufman Fund. Attendance at the Assemblies however is not restricted to voting delegates. DUCC members are encouraged to make plans to attend at least one international diaconal event. It is a wonderful way to connect across denominations and cultures with others expressing ministries of service and education. The previous DIAKONIA World Assembly was in Chicago, Illinois, USA, in 2017. Many diaconal ministers were in attendance. DIAKAID, is a program of DIAKONIA World Federation, funding special diaconal projects and emergency responses of member associations and communities throughout the world. DIAKONIA World Federation has declared the 26th of each month as a day of prayer for diakonia around the world. 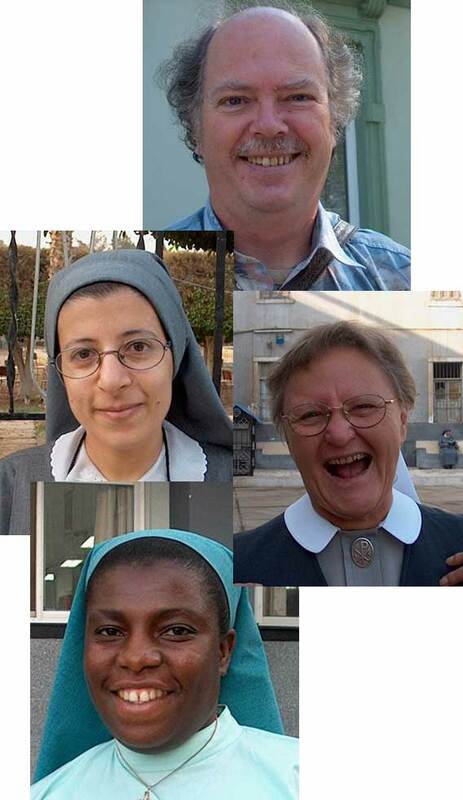 DIAKONIA World Federation works with other ecumenical agencies in the world, including the World Council of Churches, PIECR (Permanent International Consultation on Religious Life) and International Diaconate Center (IDC). A Conference jointly organized by Justice and Diakonia, Just and Inclusive Communities, and Mission and Evangelism programmes of the World Council of Churches in Colombo, Sri Lanka, June 2-6, 2012 produced a paper “Theological Perspectives on Diakonia in the Twenty First Century”. DUCC member, Barbara Lloyd attended the Conference. Christina Paradela, a United Church Diaconal Minister and DUCC member attended a World Council of Churches gathering in Sao Leopoldo, Brazil (November 2011) examining educational models for diaconal outreach ministries. Read a report on her experience. 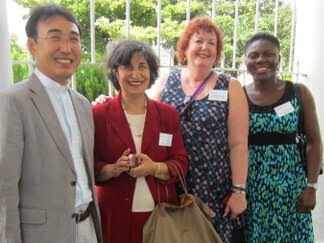 Barb Lloyd (blue dress) with Korean, Lebanese and Nigerian participants in WCC Diaconal Conference in 2012.